Tail light installed on a RAF 2000 GTX-Se-FI. Port side (red- like port wine) position light. Starboard side (green) position light and lower strobe can also be seen at left. Plan on doing some night flying in your gyroplane? Then plan on selecting a set of position lights. Position lights are color coded just like boats. Red to port, Green to starboard, and White at the aft end (there is no stern on an aircraft). These lights are required and are not optional for aircraft flying at night in the United States. The purpose of position lights is to assist other pilots in recognizing not only the size of aircraft but also the direction of travel and approximate rate of travel (if ground cues are present). Position lights must be functional for night flight. So you better get some spare bulbs when you order your position lights. Position lights on general civil aircraft are of a standard size and intensity and available in either 12 or 24 volt ratings. Ensure you order the correct voltage lights for your electrical system. 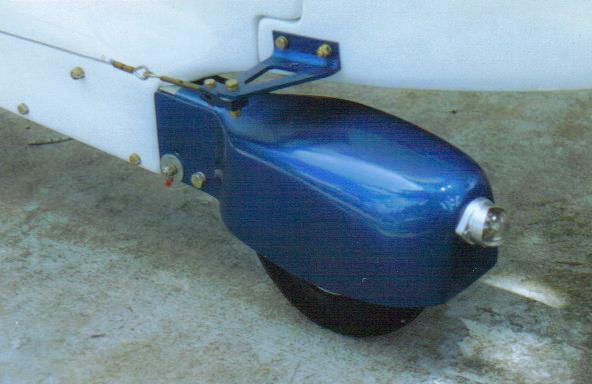 Position lights do have different ways of mounting, select a type suitable for your gyroplane installation. A new option at the tail light position and beacon location is light emitting diode or LED light. LED's use less electrical power than incandescent bulbs and tend to last longer. LED's can be extremely bright and have superior color compared to other colored lights. I have not seen these lights available for the left or right hand positions yet but it wouldn't surprise me if at some point they will be. Follow the installation instructions that come with your position lights and save them for future reference. Look at what is available and add a set of position lights on your shopping list then when ready click on over to Strobes or Auxillary Lighting to learn more on lighting your autogyro.